I love going up to Chico for yo-yo club. Wait, that’s not true. I love going up to Chico to hang out with Bob, Thad, and Richy as yo-yo club goes on. While I love being out in the throng of club with Augie and Gentry, checking off tricks and teaching kids how to do Eifel Tower, I really love sitting in the back office and talking shop. Thad never fails to deliver goodies for me to try. “Here, look at this!” is a common greeting as he shoves a pile of prototype shapes, colorways, and finished products into view. A few weeks ago when I was up, Thad slid me a marble blue and black Manimal. I had tried the Manimal proto a few months earlier, but this was the first finished product to hit my hands. Along with the Manimal was an XL and an early prototype of what is now called the Flyer. My hands went to the Manimal first. Here was a neo classic shape with what looked to be a few twists. The colorway looked like black ink swirling in clear blue water. The colorway is almost surreal in how easy it is on the eyes. Thad and Bob lent me the Manimal and XL for review and from one yo-yo to another, I was impatiently waiting to get my hands on it. The Manimal has a two step catch zone. While it would not technically be considered an H-Shape, it is not a traditional curved or straight gap either. The first step is rounded off on both sides and slants inwards at about 10 percent before curving off into a concaved inner wall. This invert was made to reduce areas of string drag for vertax tricks. The theory is that the string will only touch the first and last corner of the catch zone and produce less friction and drag than a curved catch zone. 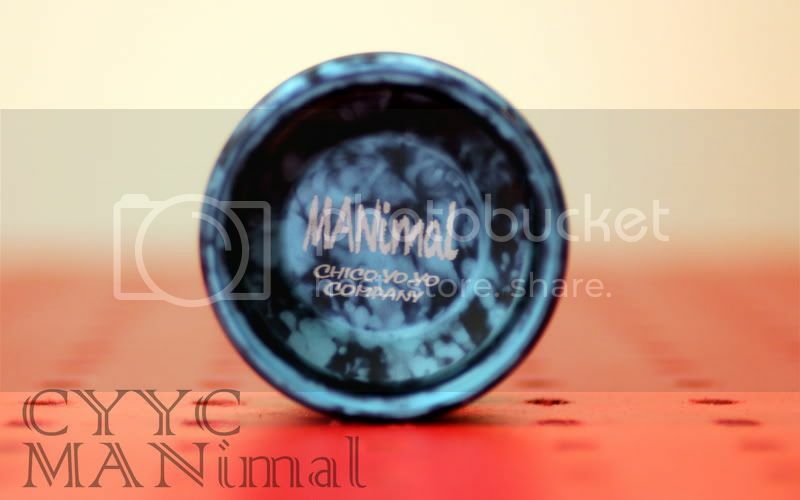 Inside the cup of the Manimal is a flat face and a well-defined lip that creates an inner ring groove. In the response area of the Manimal is a groove for silicone, a C-Sized bearing, and bearing seat machined with a moderately deep well and a tapered bearing seat. The Manimal hits your hand very comfortable. The angle of the outer rim hits the natural curves of your hand. The catch zone is wide enough to comfortable house your middle finger but still keep your skin off the wrapped string. The finish is really smooth. It has a soft blast feel to it. I am not sure what treatment they used but it was really smooth on the skin. The Chico Yo-Yo Company knows exactly what they are doing. The Manimal has a raw yet refined feel to it, like a cougar roar. It plays smooth and fast and has a powerful feel to it. 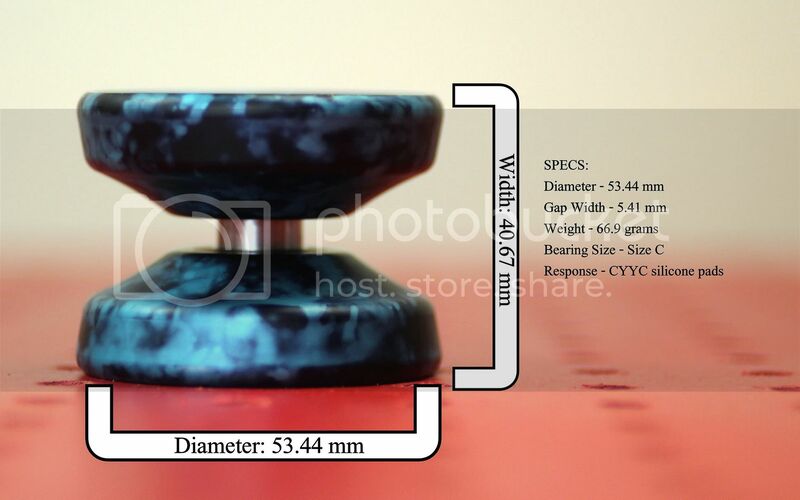 The Manimal weighs in at 70 grams with the weight placed at the core, mid, and outer rim. This gives the Manimal a heavy but stable and controllable feel to it while still delivering long spin times. The response area of the Manimal extends a bit beyond the silicone groove which increases tilt recovery. It is not quite a complete highwall but still has the manual tilt control. The Manimal falls right in the mid-sized range which makes it great for maneuvering through tight configurations and the concave catch zone opens up string rejections very cleanly. Zero vibration or wobble, the Manimal spins cleanly and returns with a tight bind. The Manimal grinds very well. The shape is not exactly designed for grinds but the Manimal will perch on your hand like a trained hawk and with a slight shift, climb your arm like a crime solving ferret. Bottom line, the Manimal is a great player. References to 80’s failed TV shows aside, I am really impressed with the Manimal. This is a great player that feels nice in your hand, strong on the throw, and excellent at long strings of trick combinations. 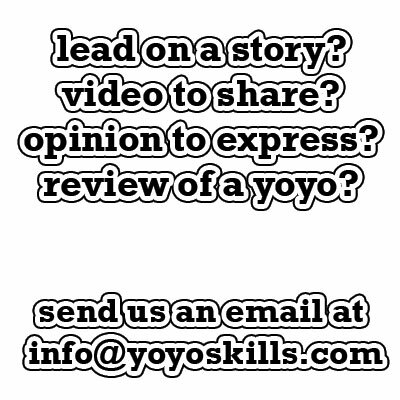 Chico Yo-Yo Company is one of those companies that should have a huge fan base but don’t seem to get that much attention. This is not a yo-yo to miss. It is competition quality and should be one you keep your eye out for.